First sentence: Here is Edward Bear, coming downstairs now, bump, bump, bump, on the back of his head, behind Christopher Robin. It is, as far as he knows, the only way of coming downstairs, but sometimes he feels that there really is another way, if only he could stop bumping for a moment and think of it. And then he feels that perhaps there isn't. Anyhow, here he is at the bottom, and ready to be introduced to you. Winnie-the-Pooh. 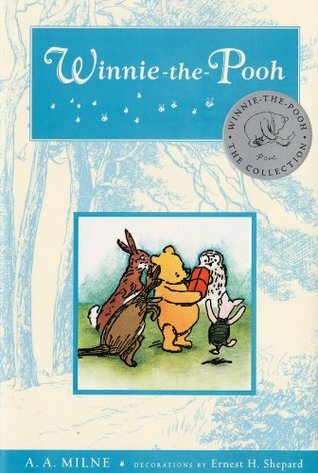 My thoughts: I love, love, love, love, love, love, love, love, love Winnie the Pooh and House at Pooh Corner. I have just about decided that I'm a blend between Pooh and Piglet. I love the characters. I love the hums. I love singing the hums when I'm reading. I love reading aloud my favorite bits to whomever I can find. I love everything about this one. The writing is the best of the best of the best. It just doesn't get better than Pooh. Original audience born circa 1920 to 1924.